Yodeling is not often connected with courtship. Nor humpback whales. The fact that I employed both in pursuit of love may, in part, explain my somewhat spotty record at wooing women. 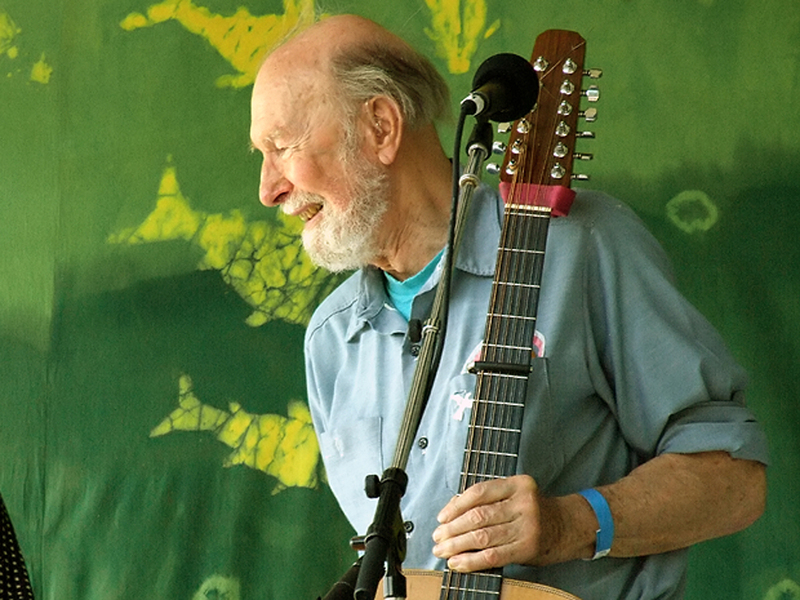 If you grew up around San Francisco Bay and remember rotary phones, you know who Pete Seeger was. Pete, who passed away yesterday, was a fixture of the SF and Berkeley folk music scene. Pete Seeger and the Weavers, Arlo Guthrie, Joan Baez, Judy Collins, Buffy St. Marie, Peter Paul & Mary…these were the minstrels of my youth, and Pete was the revered elder, the crafter of anthems, the troubadour whose clear clarion voice would sing us out of troubled times. His singing style–head up, chin out, a smile on his face–gave me hope, and made me happy, even when the words were sad. I sang his songs around campfires. I listened to his banjo and 12-string riffs with joy. His music was simple, uncomplicated, poetic, and was always there in the backdrop of my youth, like wind in the trees, like the gloaming song of crickets. Still, not really the stuff of romance.